Finally a warm enough day for popsicles! and poured them in. The girls could hardly wait until they were frozen to eat them. she only had a few licks before she realized what was happening, lol. Brynley and Brookly licked theirs clean and asked for more the next day. Blend together and pour into molds and freeze...Walah! Blend and pour into molds...Freeze! and ate a few bites so they could have some "cake"
You can find the recipe at BEST BITES..
.(be careful, you'll be hooked...these ladies have some AWESOME recipes! 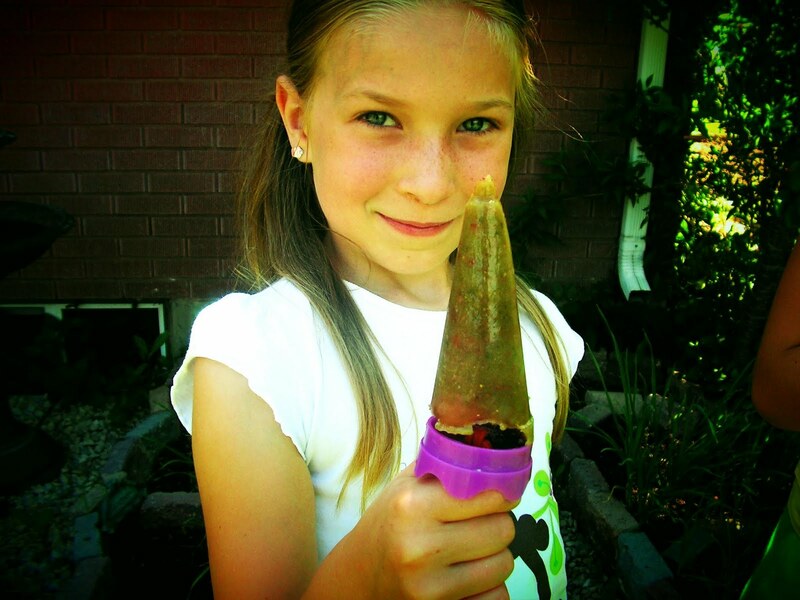 We love smoothie popscicles! But mine are usually just whatever fruit/yogurt combo I have at the time. I do love to sneak spinach, tofu, and carrots in (note: NEVER do peas!) I plan to buy kale on my next grocery trip!